I have always been addicted to the news. When I was in the eight grade, I was often called on to give the class a morning report on the day's news. These days I have more newspapers to read. Sometimes the choice of what to read is overwhelming. I always stop by the Washington Post, the NY Times and occasionally visit the Toronto Star, San Jose Mercury News, The Seattle Times, and the Halifax, NS Chronicle Herald. One of my favorite papers is the Roanoke Times which I always read when I am home in Virginia. I recently ran across this in an article in the Economist online. My wife has been saying that for years. When I traveled a lot, my first challenge in a new city was to find a newspaper. Today many large city newspapers without a national audience are under tremendous pressure. Their readership is declining, and they're having to do everything possible to cut costs. However, I am convinced the same thing is not happening in small town America, at least yet. 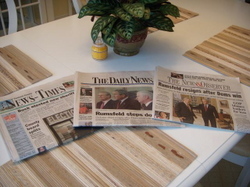 I know there has been some consolidation over the years, when I started visiting North Carolina's Crystal Coast, I was impressed by the numerous newspapers. Each has it own local flavor. In a world of rapidly changing communications, I think it is fantastic that the printed word on newsprint still has great value. The southern gentleman, RJ Berrier, in the picture to the left spent fifty years as a newsman in Mount Airy, North Carolina. To him a newspaper was a way if not the best way to record local history. I think RJ was right then and today. The world he wrote about before his death in 2000 has not changed so much that we should give up on keeping a record of our local history in print. If you have been around technology very long, you know that software comes and goes, files become incompatible, and yet the paper record somehow survives and with bits and pieces of our culture that might never make it to a CD-ROM or DVD. The small town newspaper turns out to be an invaluable look at us as a people. One the things that is so often missing even in on line versions of newspapers are the pictures. Sometimes you get a picture that almost captures the essence of a person. 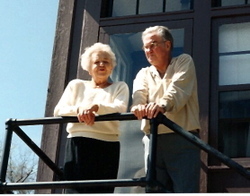 The lady in the above picture is my mother who died at the age of 93 in 2004. I have no idea which relative took the picture that I have included in this post, but I have scanned it and will soon have it on a DVD. My mother, whom I always considered the last grand lady of Pine Street , always read her morning newspaper while drinking her coffee. It was the way she started her day. Often the first thing she would read is something that RJ had written. Occasionally he was brave enough to write about her but not often. As I wrote in "Love and Respect for Print," RJ believed that newsmen have a sacred duty to make sure that all names were spelled correctly. It was only right since many people only made the news a few times in their whole life. Today it is easy to drown in a sea of digital images. Yet if the images have no story they will eventually meet the fate of all pictures without names. I hope my posts provide context for some images that are important to and my family. Yet the challenge is making sure that the images and text survive the inevitable disappearance of both Typepad and me. It's likely the only real way to be sure that they make it for the next generation is to print them. Perhaps if I can print my posts, they will become my own personal newspaper. At least I rarely have trouble agreeing with the editor. I am a huge fan of the iPhoto coffee table books, and try to make one about every major trip I take, or significant events otherwise (weddings, college, Army). The challenge is really pre-2001, before digital cameras became mainstream. Obviously the scanning is time consuming, but worthwhile once you get the hang of it. The bindings and paper appear to be extremely durable. Obviously, we'll see how long they last after years of being passed around and looked at, but isn't that the point? Speaking of points, you delve into one of my favorite topics, news and print. A voracious consumer, for dailies, I take the Washington Post, Wall Street Journal. NY Times on Sunday, and Vienna Times on Wed. Periodicals include Time, the Economist, BusinessWeek, and Vanity Fair. What I like about print is that it allows you to escape the limitations of screen, as well as the 8.5 X 11 constraints. I love the full page graphics that show multiple variables in multiple colors that can convey so much meaning. If you haven't been to a Tufte seminar, his books are spectacular. However, the online news outlets are catching up, and they are invaluable when you don't have access to the print version, or they have an impressive multimedia display. The WSJ & BusinessWeek have some excellent feature sets with both Flash and video, which obviously print can't recreate. I believe these are complementary features which I like for both print and online. I have a relative who has failing eyesight, and each year I give her the NY Times Large Type edition, which is a weekly. She loves it, since she can't read the local paper since the type is too difficult for her to read. I don't believe the old adage is true anymore about the only time someone should appear in print is at birth, marriage, and death.